So far as I can discover, when the Imperial line came into production, it immediately became the top-end for desk-mount pens; there does not appear to have been a PFM with a long tail. Over the course of the 1960s, it rather pushed out other forms of desk pen made by the company, so that by 1973 it is the only shape of desk-dwelling fountain pen Sheaffer was making. The Imperial name also fell of them sometime around then, as they appear in the catalogue only as “‘White Dot’ cartridge pen”. Lack of resources leaves me a little helpless as to whether there was a Targa desk version, but I don’t think so– by 1973, the section had specialized into a desk-socket only shape with a trim ring replacing the clutch studs of earlier versions, a shape which allowed the same sockets to be used on both the fountain pens and the larger of the two types of ballpoint Sheaffer offered for the purpose, and these desk-specific creatures appear in catalogues well after the appearance of the Targa. The tails of these pens remained relatively traditional, looking little different from the Thin Model predecessors. The sockets, on the other hand, differed greatly. 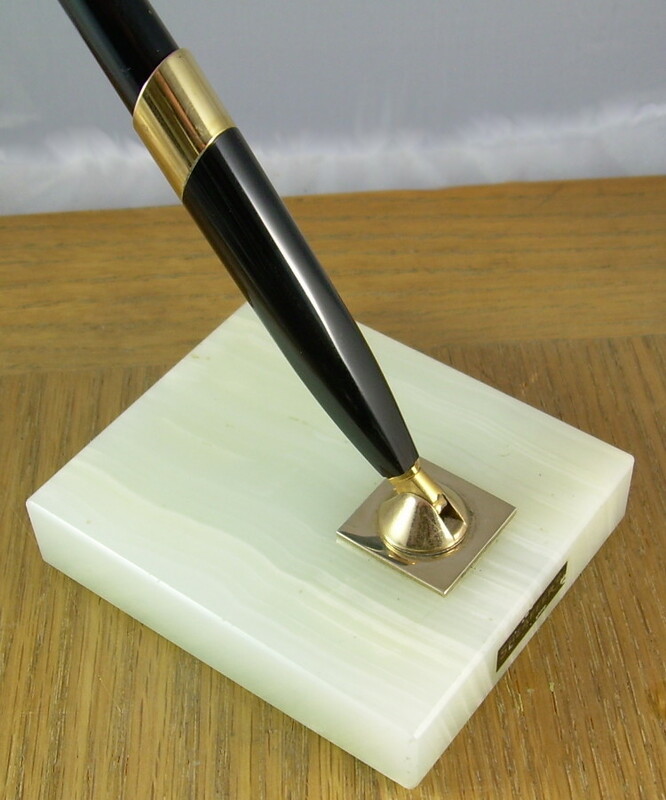 While the shape of the Sheaffer socket had not changed much from the late 1930s, being an inverted bell of increasing attenuation as time passed, the introduction of the Imperials saw a make-over. The open end of the socket was straight-sided and obliquely cut, and the end attaching to the swivel was squared off to follow the motif of the caps in the pocket pens. This shape, once again more or less attenuated depending on the time of production and whether there was a pen or a ballpoint down it, remained the standard for Sheaffer’s desk sets henceforth. Production Run: 1961 – c. 1990 (the latter date being little better than a guess; there’s no sign of desk sets of any sort in the 1992 catalogue I’ve got, but that doesn’t mean they weren’t in production). Cost When New: Varies with version and base. Size: Some variation by version and age. Point: Variants appear with steel and 14K gold. Filler: Touchdown, capacity approx. 0.7 ml., and cartridge-fillers, capacity approx. 1.1 ml. The TD versions don’t appear in the 1973 or later catalogues. M06 base, with plastic socket. Observe the square cross-section of the narrow end.